When folks start saving seeds, their biggest fear is usually cross-pollination between different varieties. But unless you are selling the seed or trying to preserve it as a named variety, a little crossing won’t kill you. In fact, growing out crossed out plants can be a learning and aesthetic experience. 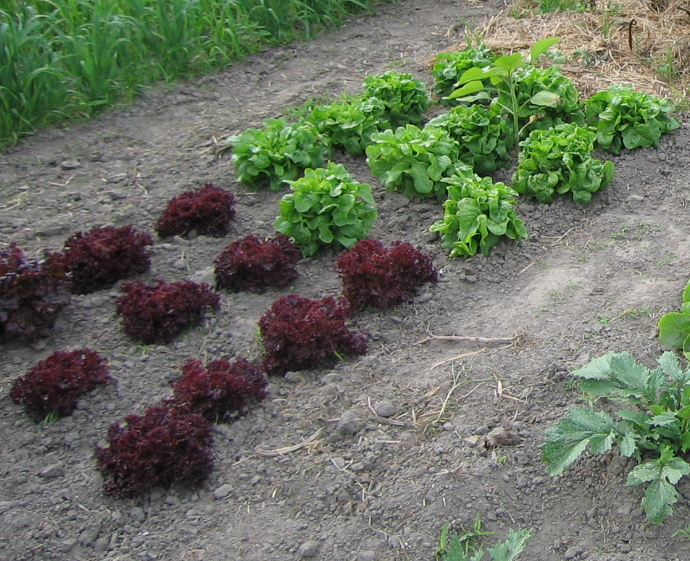 With some crops, growing two varieties within 100 feet of each other will easily result in 10-20% of the seed being crossed. Other crops barely cross even planted right beside each other. 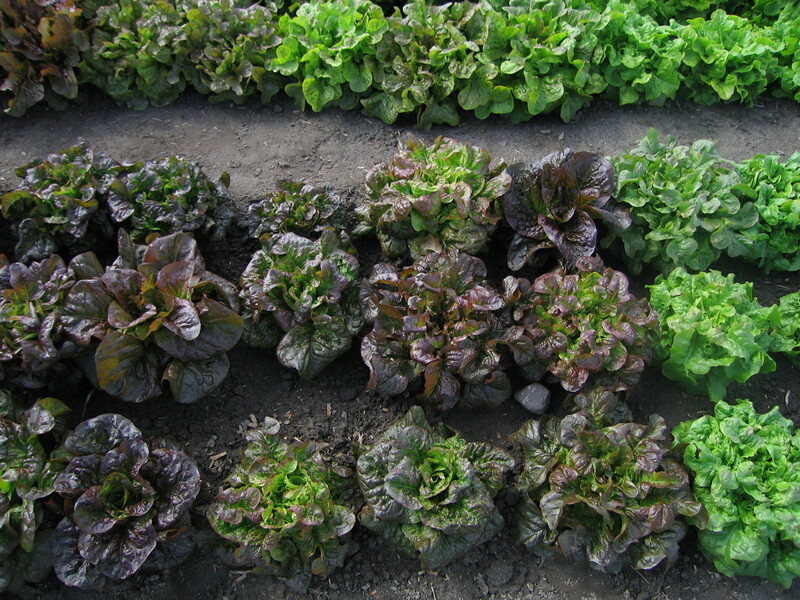 Lettuce is one of these stubborn crops. In 2006, I attended a plant breeding workshop partially led by Frank Morton at the annual MOFGA farmer to farmer conference. 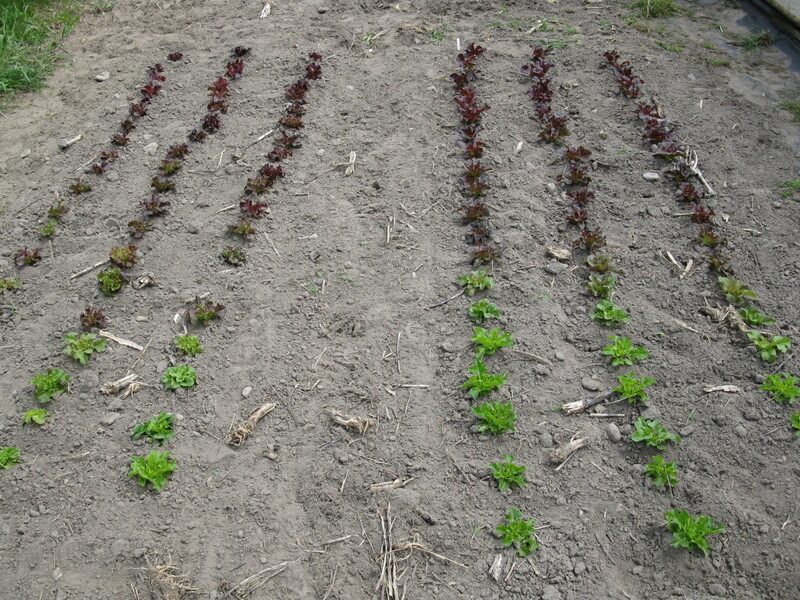 Frank explained that to get lettuce varieties to cross he grew them side by side. 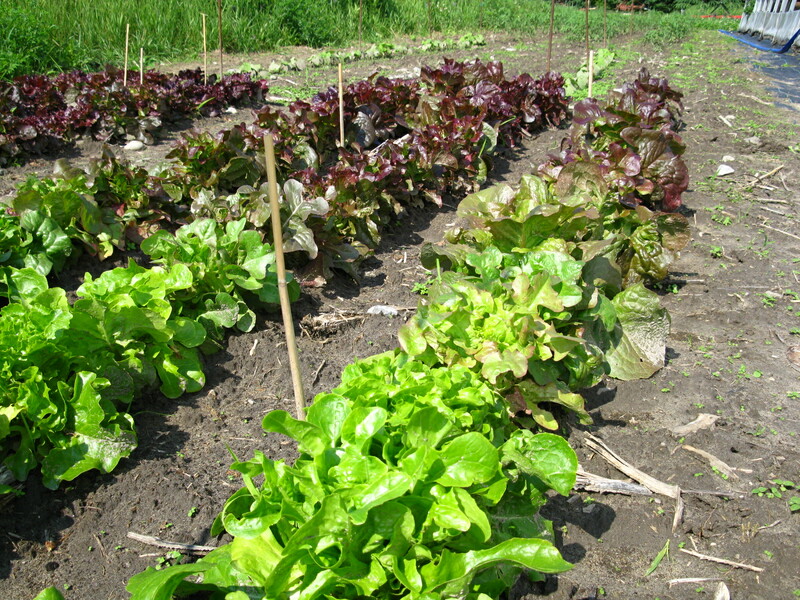 When the lettuces bolted, he bent the flower stalks from each plant together and tied them up. This encouraged insects to travel between the flowers of both varieties increasing the chance of a pollen exchange. In 2007, I followed his advice. I grew out a small green oak leaf and a red lollo rossa side-by-side. When they bolted, I tied the flowers together to encourage cross-pollination. (I don’t have a picture of this.) I saved the seed from each variety in separate well-labelled envelopes. 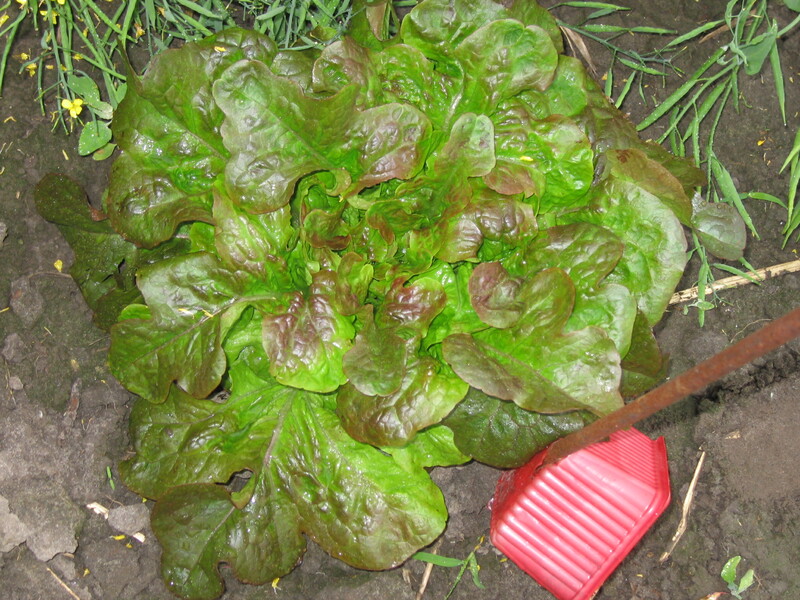 In 2008, I grew out some of the lettuce seed. I thickly sowed the seed in open flats in the greenhouse. When the seed from the green oak leaf plants germinated, out of hundreds of green seedlings, a few had red leaves. These different coloured seedlings were the crossed individuals. I grew these plants out. They all looked similar to this picture. You can see some blending of the parents’s characteristics – oak leaves with a reddish blush. However these plants were much bigger than either parent. This first generation after crossing is called the F1 (first filial) generation. It is usually quite uniform and often very vigourous. I saved the seed from each F1 plant separately. In 2009, I grew out 30-40 plants from each F1 plant. Whereas the F1 plants had all been similar, the F2 generation expressed all types combinations of the original plant’s genetic traits. I had expected this but was still caught unprepared. I didn’t know what to do with these plants. 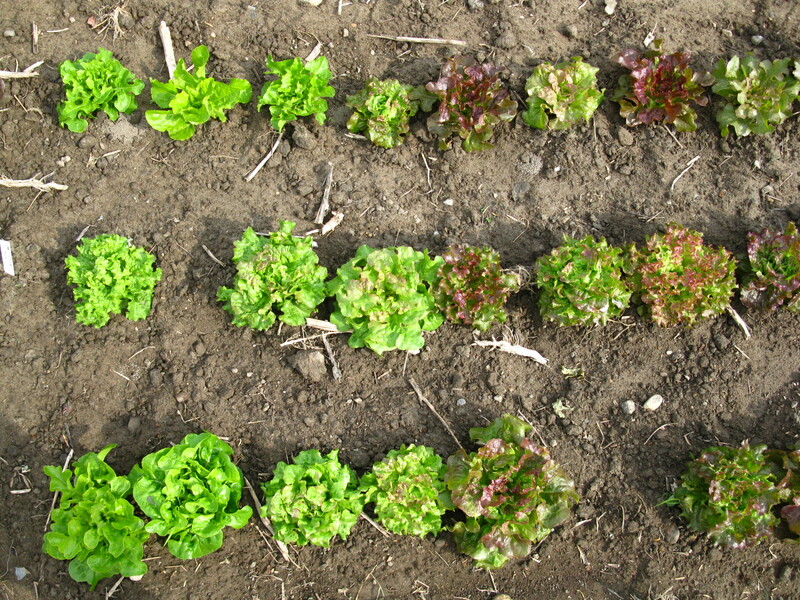 Each individual lettuce was a new potential line. If I saved seed from each plant to grow out in seperate batches the following year, I would never have the space. I was paralysed. In the end, I saved seed from all the plants and just mixed it up to use in salad mixes. I also made a plan for the next year (which is this year). In 2010, I grew out some more seed from the 2008 F1 plants. 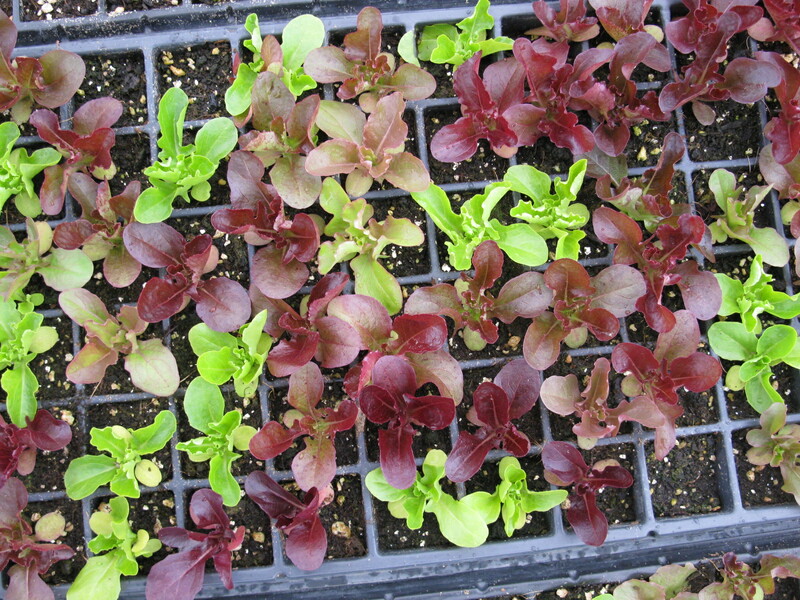 I started the seed in the greenhouse ( see this post to read more about that). 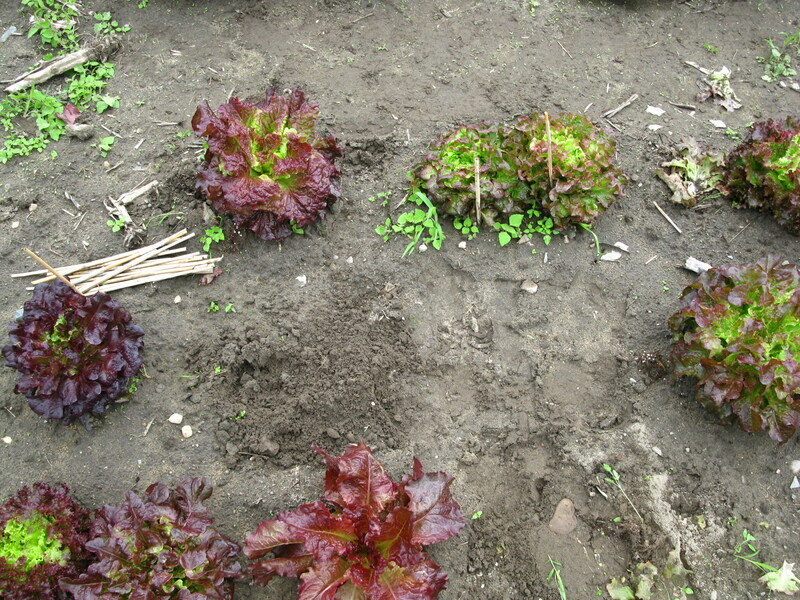 Late April to early May, I planted the lettuces out by colour – the reddest plants to the greenest plants. I also planted the seedlings on 6″ spacing (I usually plant lettuce for seed 12″ apart) to get more plants in the same area. 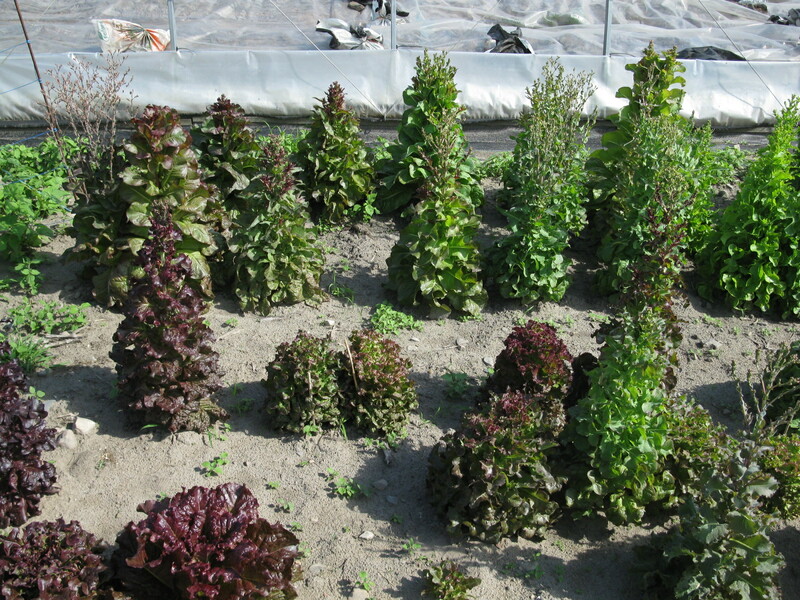 Near the end of the May, I started cutting the inner leaves of the medium-sized plants for mesclun salad mixes. This let me devellop a relationship with each plant. I marked any plants that stood out and pulled those I didn’t like. I harvested this way once a week for three weeks. 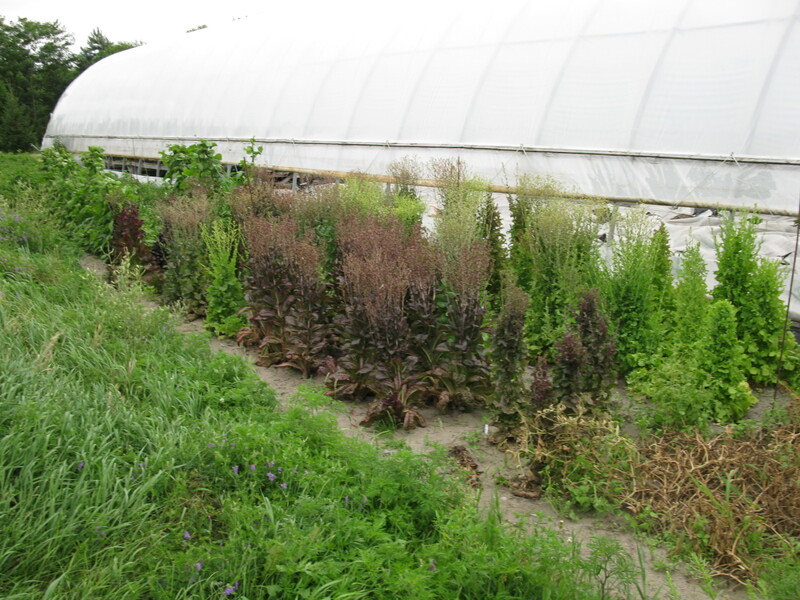 When the plants were bigger and somewhat bitter, I culled more agressively to leave at least 12″ spacing between plants. In the next day or two I will be bring these plants into the barn to dry. Now, I have to make a plan for next year’s growout! Hi, I realise this is an old post, but I am fascinated by your experiments and will be following suit. What became of this project? 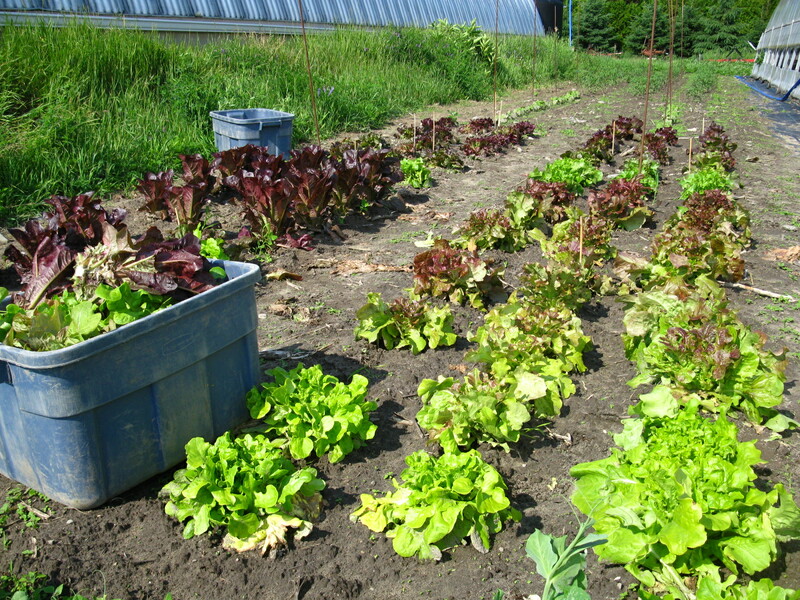 I’ve taken a few years off from these lettuce selections. Though there was a huge amount of diversity, I was having a harder time narrowing down what I was selecting for.